Joining in again with Macro Monday to get back into the swing of things. have found to add to this project. in the South which of these creatures are safe to touch and which are not. be great for your Mayhem Monday!!" Mayhem Monday.. that's what it should be called when I'm spending time with them on a Monday. 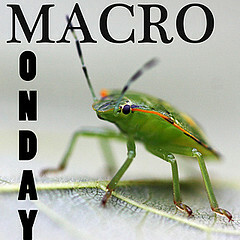 So that's it for me... check out the other Macros. You captured some great details of this guy! Caterpillars are the most amazing things to me, how they melt down to goo and rebuild into a butterfly. I wish I could do that...with Tom Selleck in mind. Interesting creature! Most of the caterpillars we have here are armed with nasty stuff that cause horrible allergic reactions if contacted. I'm with you , I only handle the bugs I know from better contact at home! Gave me a shock the first time I got bit by a lady bug. Of course it was an import bug. So cool to see, but kinda raises my arm's hair thought..